Welcome to NBA Jam! You just totally heard that in Tim Kitzrow's voice. Know why? Because NBA Jam was everywhere in the early 90's and the coin-op devoured over $1 billion in quarters in its lifespan. This was Midway's second attempt at an extreme basketball game after the moderately successful Arch Rivals of '89. This time, Midway received the license from the NBA and the rest is history. There were two schools of thought when it came to making arcade games back then...create something insanely realistic with digitized photorealistic graphics, believable physics, and deep play mechanics (e.g. Mortal Kombat, Area 51) OR create something fantastically over-the-top with colorfully drawn environments, physics-breaking capabilities, and unreal characters. NBA Jam mashed both concepts together to create one of the most unique incarnation of a sports game ever. It was a classic case of gamers not knowing they wanted it until they had it. And what NBA Jam had was something so rich and unique that it bridged the gap of pure gaming enthusiasts and sports fans thus being alluring to both groups. 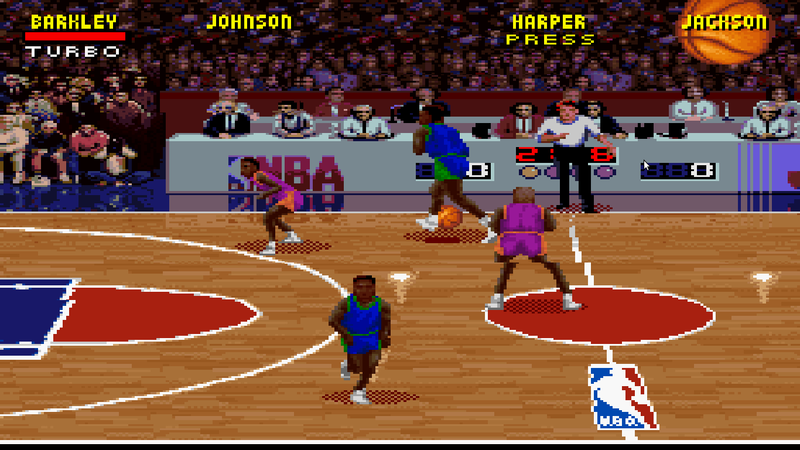 There were gamers who wouldn't play sports games, but would play NBA Jam. And there were sports fans who didn't hang out in arcades, but would congregate in groups just to play NBA Jam exclusively. 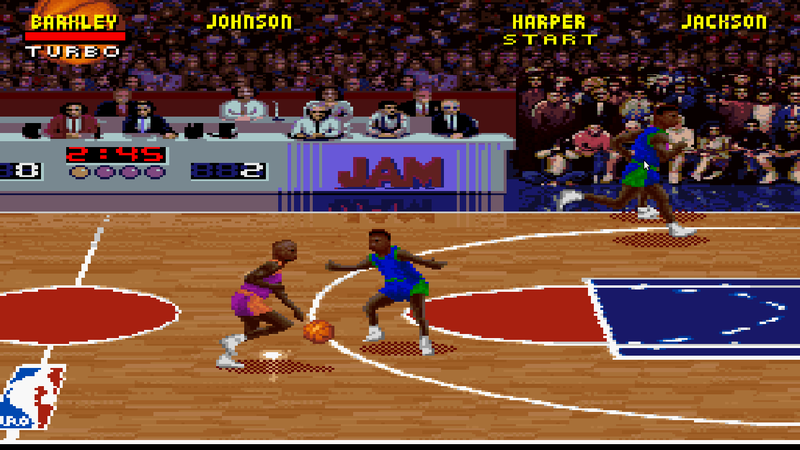 NBA Jam would go on to rank in the top 15 highest grossing arcade games ever released. Despite its amazingly realistic look, the actually gameplay itself is where NBA Jam set itself apart from anything we had ever seen before. Up to 4 players could engage in a series of 2-on-2 games with (most of) their favorite NBA players from any of the teams at the time. Apart from goaltending and 24-second violations, there were no penalties. This meant that it was totally okay to push and shove your opponent in order to make them give-up the rock. On offense, the game's ridiculousness factor was cranked way up! Yes, you could shoot your typical 2 or 3-point shots, but for real flare, why not...say...dunk from mid-court...WHILE SET ON FIRE!!! Oh, yeah! That's what made NBA Jam so loveably iconic. Yeah, these players looked and behaved realistically until that moment when they would do a triple flip in the air and break the backboard on a vicious dunk! All the while, you had the amazing voice talents of Tim Kitzrow on commentary. A sample: "He's heating up!" "He's on fire!" "Boomshakalaka!" 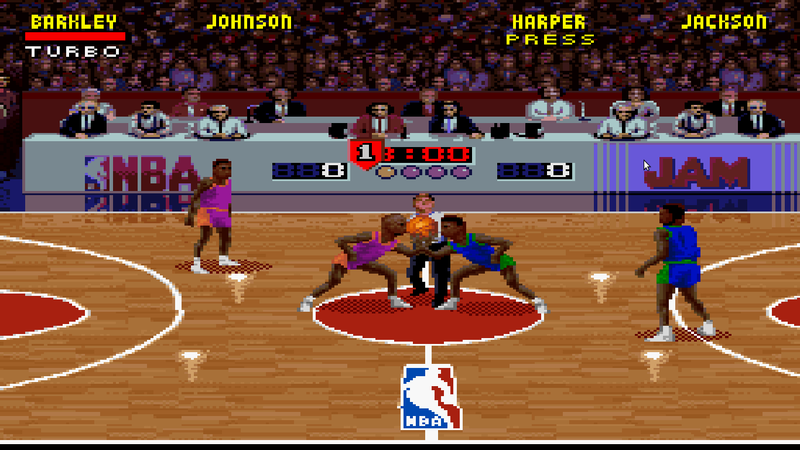 Yep, NBA Jam is from where those terms essentially sprung. In fact, it's that sort of color commentary that would later inspire sports journalists (most notably those at ESPN) to adapt their running commentary in a more colorful and comedic way. 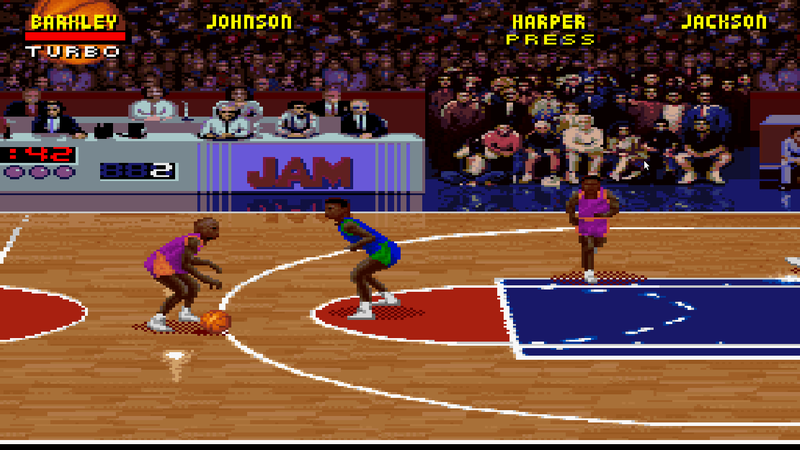 NBA Jam was cathartic, rewarding, and downright hilarious in its own right. This was the kind of basketball we all wished we could see in real life. Vlade Divac hitting threes from full court. Reggie Miller elbowing Horace Grant right between the goggles. Shaquille O'Neal throwing down a nasty 360 spin dunk and shockwaving defenders to the ground. Later, Midway would adapt their NBA Jam formula to other professional sports like football in NFL Blitz, hockey in NHL Hitz, etc. Meanwhile, the SNES received a port and it was the very best version on any console at the time. If you were super-cool, you could use an XBAND (yeah, go Google that!) and play online! Yup. 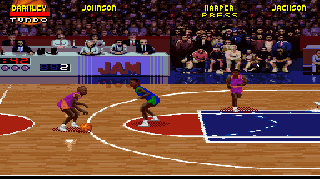 If you had the money, the equipment, the know-how, and a decent phone line, you could play NBA Jam online with other players who also had the same money, equipment, yadda. 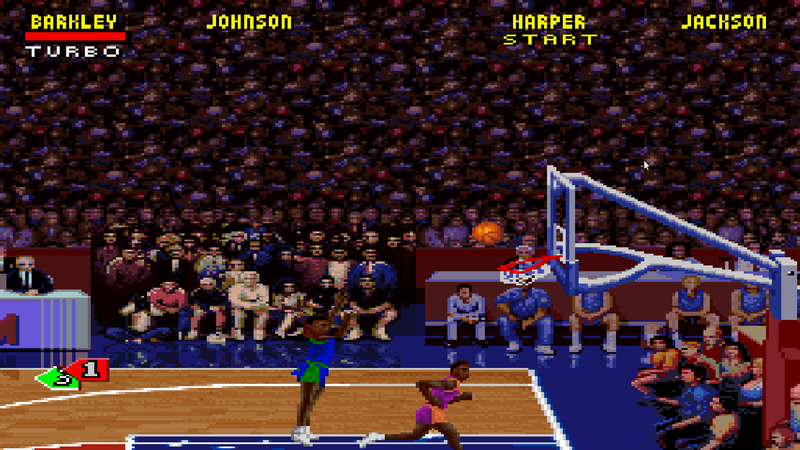 Just as the game of basketball began in 1891 with Dr. James Naismith using a wall-mounted peach basket and a ball, NBA Jam adapted a relatively simple principle and threw in a cornucopia of nontradition to create one of the most satisfying and universally beloved arcade experiences ever. And that's BEFORE you realized that you could unlock big head mode or Bill Clinton as a playable character! Now you can add videos, screenshots, or other images (cover scans, disc scans, etc.) for NBA Jam (USA) to Emuparadise. Do it now!